Published: April 24, 2014 at 05:02 p.m. Updated: April 24, 2014 at 06:43 p.m. 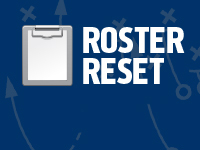 In our Roster Reset series, we noted the San Diego Chargers' need for pass rushers this offseason. Help is on the way now that Dwight Freeney is recovered from a quadriceps tear that ended his 2013 season in late September. "The doctors have said that I've healed completely," Freeney said early this week, via ESPN.com. "So now it's all about getting my strength back." Forced to accept a pay cut in March, Freeney has taken notice of legendary pass rushers such as Julius Peppers, DeMarcus Ware and Jared Allen being discarded by their former teams this offseason. "It just tells us that it's a young man's game," Freeney explained. "We all understand it. We all get it. We might not like it, but that's what it is ... But we still have value. For teams that want to win now, that's what's happening." Although he turned 34 in February, there's good reason to believe Freeney has plenty of gas left in the tank. Before the quad injury, he put a clown suit on Texans All-Pro left tackle Duane Brown in the season opener. Freeney's return combined with 2012 first-round edge rusher Melvin Ingram's surprisingly effective play down the stretch gives John Pagano's defense a couple of disruptive forces it lacked for the majority of last season.